Parasol Basketweave-4 Hummingbird Feeder, Clear, 18 oz. 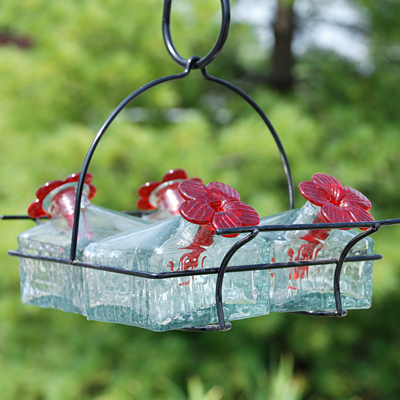 Create an exciting feeding spot for hummingbirds using the Parasol Clear Basketweave-4 Hummingbird Feeder. This impressive unit adds texture and style to your bird garden, thanks to its metal frame and glass vessels. Each of the four square vessels is made of hand blown, recycled glass, and the shape is inspired by 1930s Depression Glass. A basketweave effect on the sides of each vessel brings interest to the piece, while their clear tone adds a timeless look. These reservoirs each hold 4.5 ounces of nectar, and a red glass flower inserts into the neck to create feeding ports. The metal frame easily holds all four vessels, and perches attached to the frame offer hummingbirds a convenient resting spot while dining. A metal arch and included "S" hook make it simple to hang this feeder from a bracket or branch. The recycled glass construction creates an environmentally conscious garden accent, which will certainly last for several seasons. Bring texture to your bird sanctuary using this Clear Basketweave-4 Hummingbird Feeder. Parasol Basketweave-2 Hummingbird Feeder, Clear, 9 oz. Parasol Bloom Botanica Hummingbird Feeder, Clear, 16 oz. Parasol Bloom Hummingbird Feeder, Clear, 16 oz. Parasol Bloom Botanica Feeder with Perch, Clear, 16 oz. Parasol Bloom Shelter Hummingbird Feeder, Clear, 16 oz. Parasol Lunch Pail Hummingbird Feeder, Tall, Clear, 17.5 oz.